Recently we spent time looking at the Parthenon in Athens, in my opinion one of the greatest buildings ever constructed. I think that looking at architecture is one of the best ways to gain insight into the past. I didn’t come up with this idea, but borrowed it from the man to whom this site pays homage. As I have said before, a civilization might throw a banking system together haphazardly, but would not do so with a sculpture. And buildings, more so than individual works of genius, reveal more because they involve the mind and skills of whole civilizations. Here is what the building probably looked like ca. 435 B.C. They built it atop of their Acropolis, the highest point in the city which served as Athens’ religious epicenter. The building as it looks today. 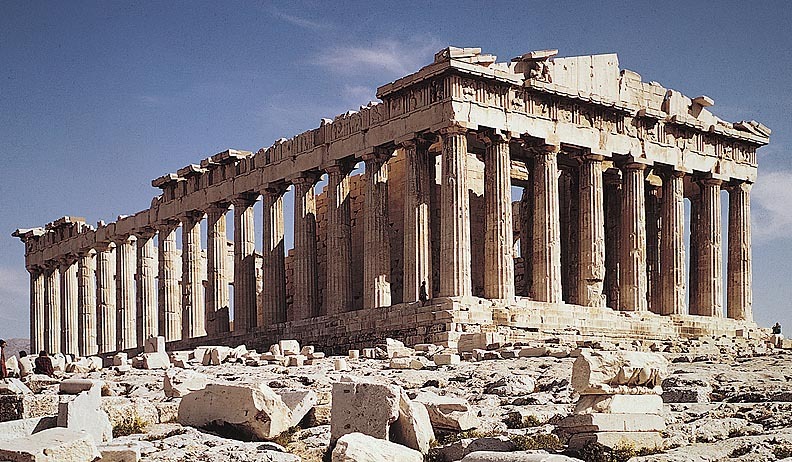 . .
Of course most people when first gazing upon the Parthenon usually think, “Yes it’s good, but what’s the big deal?” We understand instinctively perhaps the influence this style has had on western culture. Banks, the Supreme Court, and almost any other building that wants to convey wisdom and trust copy this style. That in itself should clue us in that the Athenians had something special in their design, but we have to look closely to see the real genius of the Athenians. When we look at tall buildings like skyscrapers on the Washington Monument, at least from certain angles, the buildings do not appear straight. Built with 90 degree right angles, our eyes fail to perceive the perfectly straight. I don’t understand the science of why this happens, but we have all experienced it. 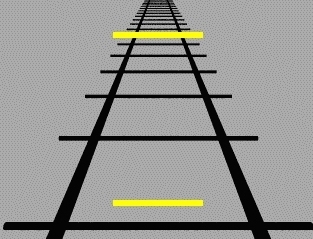 Part of it has to do with how our converging line of sight deceives us. For example. . .
the top line appears longer, but is in fact the same size as the bottom line. 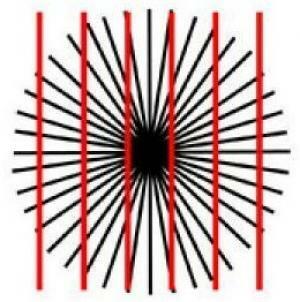 In this second image the middle lines appear bowed, but are perfectly straight. 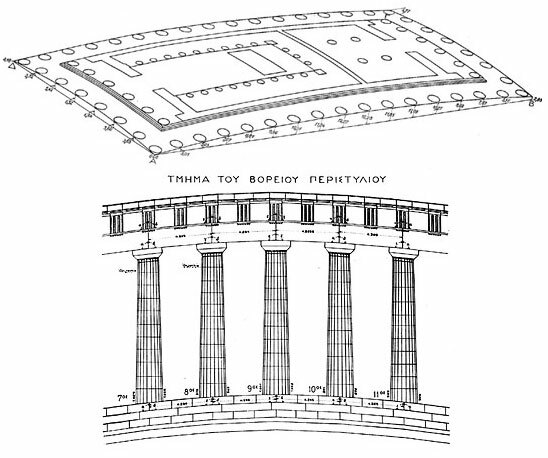 In fact a close look at the Parthenon reveals few right angles. Each of the thousands of column drums remains an unique construction to that particular column. This is not a lego set of interchangeable parts, but each part of the building stands as work of art unto itself. If you have the time and interest, this video, and especially the last 30 minutes, give a good overview of their techniques in creating this building. 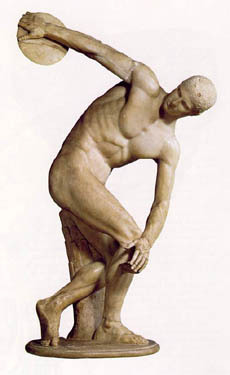 but we can say with only slight exaggeration that the Greeks did nothing but idealize people in their sculpture. The Athenians went to tremendous lengths to bring make this ideal of perfection at least seem real among them in stone. 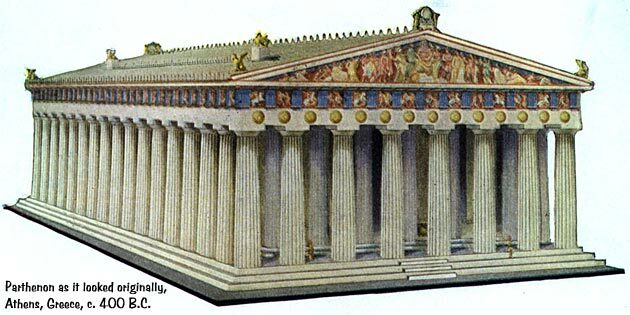 In theory, the Athenians built the Parthenon as a temple to Athena. Originally a huge 35 foot statue of Athena overlaid in gold stood right at the center inside the building. But architecture rarely lies. The figures on the outside of the Parthenon tell a different story. Here the Athenians put sculptures of Athenian heroes, with the clear intent of showing that the gods and men can intermingle, that Athens itself can achieve the perfection the gods embody. That, at least, is one interpretation. But another interpretation argues that this “temple” to Athena merely served as a cover for their true (even if subconscious) intent to glorify themselves. It would be as if we built a church and called it “Trinity Church,” but put images of George Washington, Abraham Lincoln, etc. throughout (this actually begs the question of whether or not American flags should reside in churches, or perhaps whether or not the Capitol building is a church of sorts). The Greek philosopher Protagoras has received a lot of bad press over the years for his comment that, “Man is the measure of all things,” and deservedly so. But before we critique him we should understand the context of what he said and ask ourselves if the Greek gods were good “measures” of things. Clearly, Protagoras and other philosophers had a measure of genuine spiritual insight in rejecting standard Greek religion as a guide for their lives. The gods lived lives free of consequence, free of any restraint other than the power of other gods. 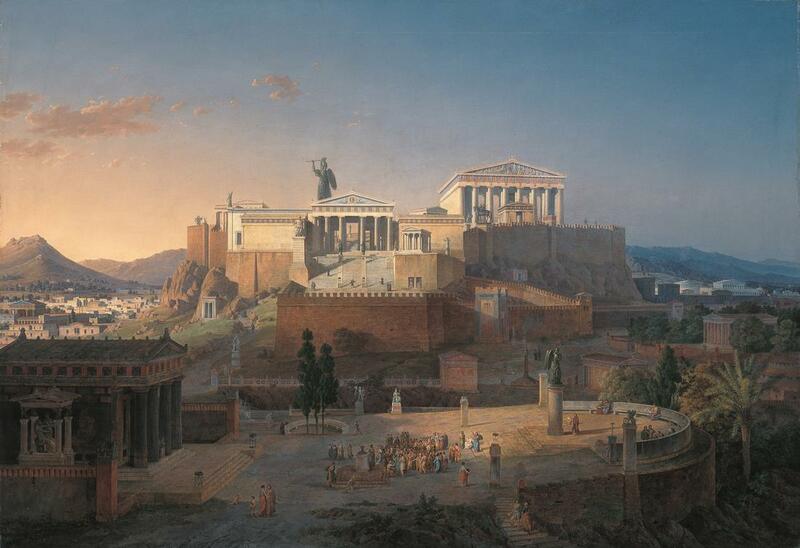 In the Parthenon the Greeks did not use the “eternal” or “mystical” dimensions as in the pyramids. 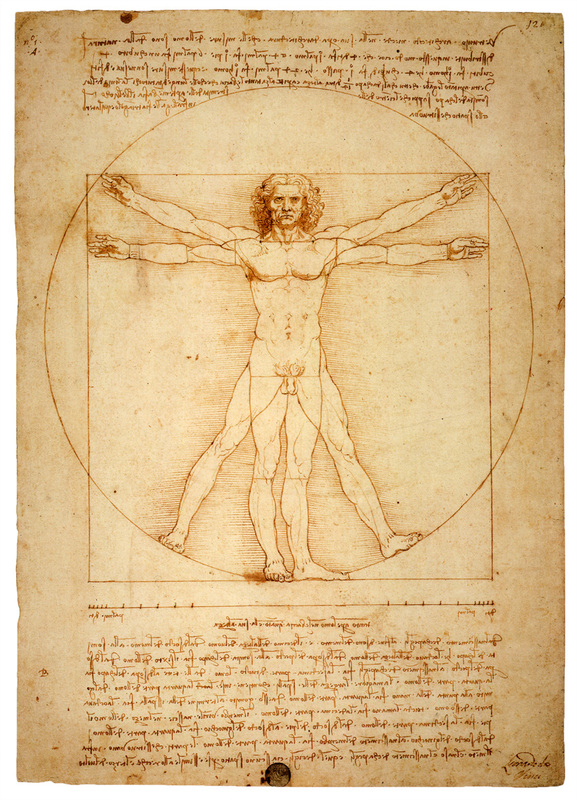 Some suggest that the proportions of the building in fact reflect the proportions found in the human body, as represented in Da Vinci’s famous “Vitruvian Man” (named after a famous Roman architect). What exactly the Greeks meant by this phrase, “man is the measure of all things” is not clear to me, at least. 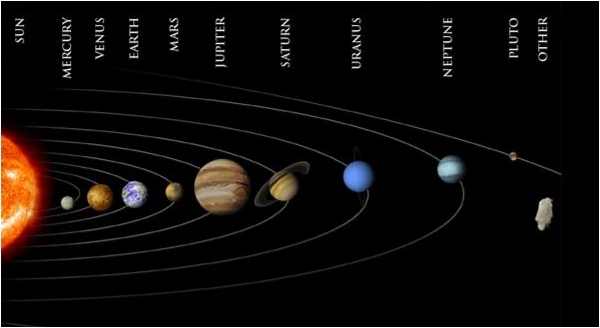 It may have been a statement of moral relativism, or it may have been a theological/cosmological assertion that mankind functioned as a “microcosm” of the cosmos itself. After all, we have physical elements to our being and spiritual elements. 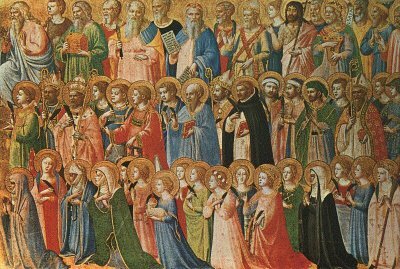 Our higher, “heavenly” aspect (the intellect) guides our “lower,” more earthly parts, and so on. Again, I’m not sure how to unwrap this phrase, and I’m happy to add it to the list of mysteries surrounding the Parthenon. This week we saw the great golden age of Periclean Athens collapse into the abyss of the Peloponnesian War. We began the week by asking why “Golden Ages” tend to last not much longer than a generation. Some suggest that the success and power a golden age brings would bring about the envy of others, and this envy could turn into a threat. Another might suggest that the generation that grew up with the ‘golden age’ in place would likely have a much different experience than their parents. I found this comment especially perceptive. As we saw last week, golden ages usually arise from a creative response to a particular challenge. Those that grow up without the challenge won’t have the experience or ‘training’ to continue what their parents started. Last week we also noted how golden ages require a variety of factors coming together at once, some physical and others psychological. No one can reasonably keep all the plates spinning for long. Eventually nature dictates that something will begin to spin off the axis sooner or later, and this will drag other things down with it. Of course the unforeseen can always occur, in war or at any other point. But since war requires a great deal of planning, many assume that the conflict will go as we wish. The making of the plans itself creates that expectation. Yet, in war as in life, things rarely go according to our preconceived version of events. After 10 years of intermittent conflict, both Athens and Sparta signed a treaty called the Peace of Nicias. But treaties in name may not be in fact. Some treaties bring real peace, some only reflect a desire to call a ‘time out’ in the fighting. Unfortunately for Athens, this treaty turned out to be one of the latter. War will put stress on any form of government and any society. Some wars brought down monarchies — like W.W. I. We assume that democracies are more stable, but the Peloponnesian War brought out many weaknesses within Athenian democracy and for a time ended it within Athens. We looked at how desperation and panic act on a democratic people in the battle of Arginusae. The Athenians won this battle, but the generals failed to pick up the dead and give them proper burial, something that could be considered sacrilege, and sacrilege could be punished by death. Grief stricken, the city put the generals on trial, found them guilty, and executed them. A few days later they regretted their actions. They put the lawyer who prosecuted the generals on trial for murder, found him guilty, and executed him also. Ostensibly, Sparta won the Peloponnesian War. But in truth the war had no real winners in Southern Greece. All exhausted themselves in the conflict. Thebes, involved in the conflict but slightly to the north, emerged as the strongest party in the more immediate aftermath of the war. But it would be Macedon, further still to the north, and never involved in the fighting at all, that would eventually assert absolute supremacy over Greece in the person of Phillip of Macedon and his son Alexander. We’ll look at them next week. You can see the geography of it below here, with everything pink or yellow caught up in the fighting (with even blue areas involved sporadically), and Macedon waiting patiently above in brown. For those of you who have seen From Russia with Love, the scene where “Number 1” talks about the Siamese Fighting Fish is a good parallel, if we think of Macedon as the fish who stays out of the fight. We all know that peace treaties have a shaky track record. When wars end we hope that the suffering might mean something, that it might translate into a political order that helps ensure that history does not repeat itself. And yet, often these treaties fail. We might think of the numerous wars between France and England, for example. Various forms of “Punic Peaces” work, whether they take the form of utter destruction or sending Napoleon to St. Helena. Most agree, however, that when we think of “peace” we often have something loftier in mind. Some treaties do work. The Civil War will not restart anytime soon. Japan and the U.S. have been friends since 1945, and the same is true of our relationship to West Germany/Germany. But many don’t work, and fewer treaties failed more spectacularly than the Treaty of Versailles after World War I. Though it may seem artificial, I think that major events should be viewed through a narrative lens. World War I had its own prologue, beginning, middle, and end. Wars tend to take on a life of their own once they get started. As the “story” changes shape one can easily forget how it all started. But this is a mistake. A peace treaty should serve as the end of a story that had a certain beginning and middle. If the end has nothing to do with the beginning, people will hate the ending and demand a rewrite, or at least a sequel. I think this is one key reason why many treaties end up being no more than pauses in the action. Combatants want an intermission, but don’t want the end to come just yet. For them, there remains more to the story. I think the victors in W.W. I would be strongly tempted to forget this principle. Any analysis of the causes of the war would have to blame a variety of factors and nations. Certainly one could blame Germany mainly for the causes of the war, but other nations had their part to play as well. Yet the combatants fought the war so grimly, and the death toll rose so unimaginably, that the victors would almost certainly think only of the fighting (the middle) and forget the beginning of the story. The ending, then, would not fit within the story as a whole. Perhaps one can take my “story” analogy too far, because if we try and keep a war purely contained as its own entity, we miss the inevitable ripple effects that have spilled out into society because of the conflict. Thus, a peace treaty has to deal with the war behind and look ahead to the world it made. This need to “look ahead,” however, does not come easily. We rarely see the nose on our own face, and lacking omnipotence, are left somewhat in the dark. Treaties usually handle the “physical” aspects of ending wars such as reassigning territory, reparations, etc. but rarely consider the psychological aspects. The horrors of the conflict imprint themselves on our minds, and the victors often want to “close the book” on that period as soon as possible. We want to move on, relax, be happy. The victors feel this way, at least. But often the losers don’t want to move on. They often want to dwell on the pain and humiliation they feel. They want to be heard, and will not want to “move on.” Exhaustion on the side of the victors, more than apathy or ignorance, can be society’s greatest foe at this stage. I think a good example of this is The Congress of Vienna, which decided that shape of Europe after the Napoleonic Wars of 1797-1815. Millions died as the French Revolution convulsed the world and every monarch knew their days might be numbered. My interpretation is that the assembled powers, smarting under years of war, tried to put Pandora, i.e. the French Revolution, back in the box. They suppressed popular movements, conceptions of “rights” — anything that smacked of the Revolution, and threw the baby out with the bath water. Some might argue that the Congress of Vienna worked to keep the peace throughout the 19th century, but to my mind the Revolutions of 1848, The Crimean War, the wars of Italian and German Unification, the conflict between Turkey and Russia, and the eventual explosion that was World War I say otherwise. Pressure cookers explode sooner or later. Try as we might, mixed messages can’t be avoided. As parents we give lip service to the ideal that we treat our children equally, but then reality sets in. The age, gender, and personality of our children all play a role in how we parent. We modify our expectations and begin to tailor certain things to certain children. Children pounce on these discrepancies immediately and bemoan their fate, but if parents keep their different expectations reasonable and at least mostly clear, we can keep the ship afloat. Every peace treaty should have justice in view, but practical reality will always intervene. 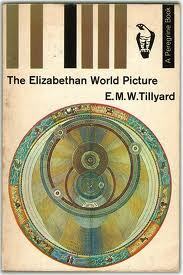 Even the justly victorious must account for the fallenness of the world and the messiness of reality. The vanquished will seize upon these crossed signals of justice and cry foul, but if the signal mixing is not too serious, they deal with it. 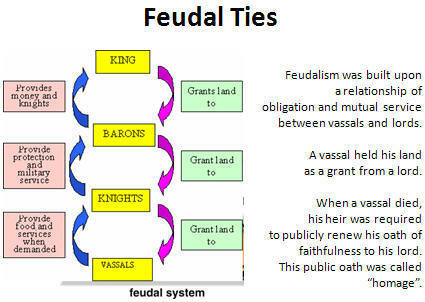 Versailles also tried to reorder Europe along the idea of “national self determination,” and the elimination of empires. Such was President Wilson’s grand vision for peace. 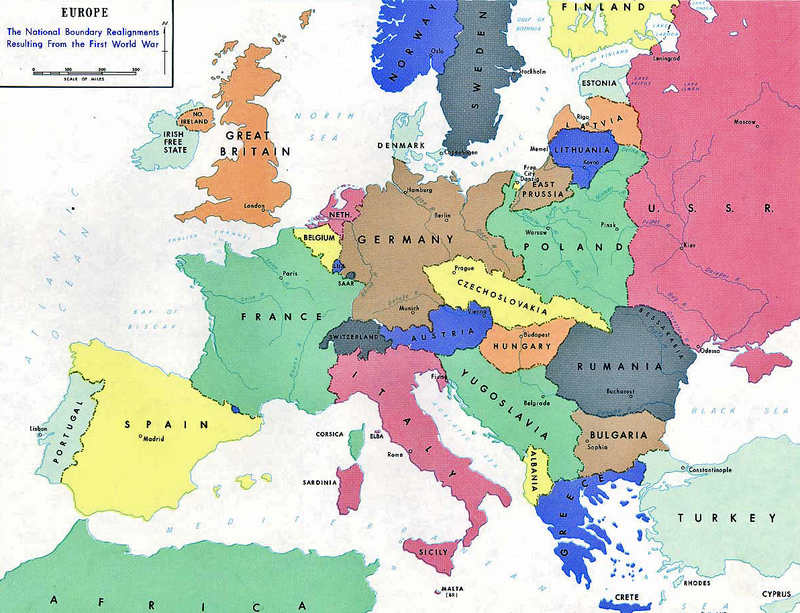 So, the war’s aftermath saw the creation of Czechoslovakia, Poland, Hungary, etc. Except for Germany — Germans don’t get to be “self-determined.” Some Germans went to Czechoslovakia, others to Poland, others faced occupation by the French. We can compare the following two maps, the first showing the political divisions, the next, the ethno-linguistic ones, and the differences reveal themselves. 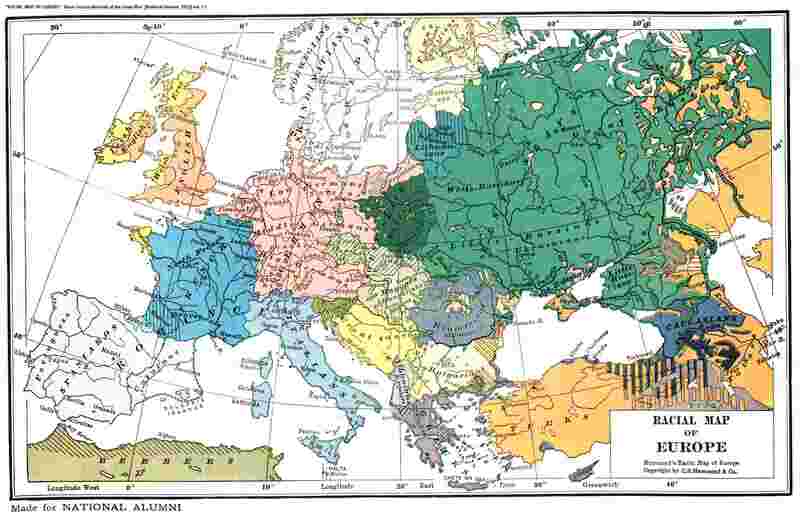 Overseas England and France kept their empires, however, but not Germany. Neither did the U.S. give up its interests in the Philippines. The gaps between “What we say,” and “What we do” grew very large at Versailles for the allies, and Germany noticed. This applies to Germany, but also Russia. The Communist Revolution threw Russia into a tumult and made them persona non grata at Versailles. They too lost big chunks of territory to Poland. Both Germany and the Soviets had little to no choice on accepting the terms given their immediate internal domestic realities . But both would seek to, in their mind, “set things to rights” as soon as they had a chance. In Europe’s case, it took about 20 years for this to happen. Next week we look at the Communist Revolution in Russia, and touch on the ‘Roaring 20’s back in America. This week we focused on The Persian Wars, a conflict that historians claim marks a transition point between Eastern and Western dominance. Persia staked a lot of their invasion, and their failure would lead to the rise of Greece in general, and Athens in particular. Our main focus Thursday and Friday lay with the Battle of Salamis, one of the more crucial naval engagements of the ancient world. As I mentioned back in September, one of the things we focus on this year and throughout the history curriculum is how to make choices. This can be applied in a variety of different settings, and this week I wanted the students to consider that on the level of strategy and tactics. The Persian fleet was bigger, with a variety of incorporated Greek city-states that had surrendered to Persia. 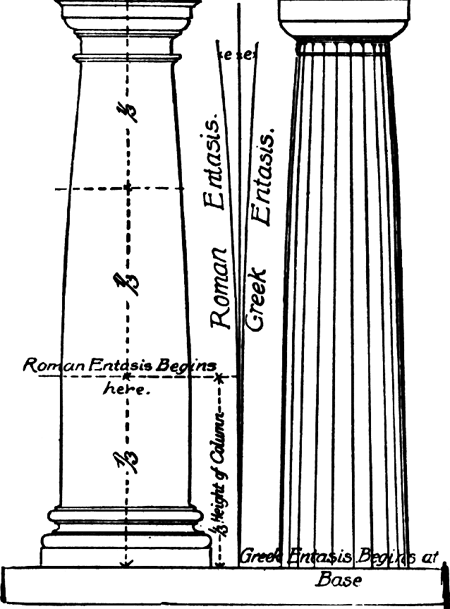 Ionians, Phonecians, Egyptians and more went into the mixture. In general, their ships were lighter and faster. Athens controlled the Greek fleet, and in general they had heavier, bulkier ships. But the weight of the ships did perhaps produce an innovation, that of a ramming prow. This in turn, led to a change in how the Athenians fought. Whereas most ancient navies wanted to get close and board other ships, the Athenians wanted to use their prow to ram other ships and sink them with a broadside charge.The Persians had sacked Athens, and the Athenians in desperation abandoned their city, got in their boats, and headed for the island of Salamis. Would an immediate battle be more to the Persians advantage, or the Greeks? If a battle were to be fought, what side would have the advantage in wide open water? What about in more narrow confines? 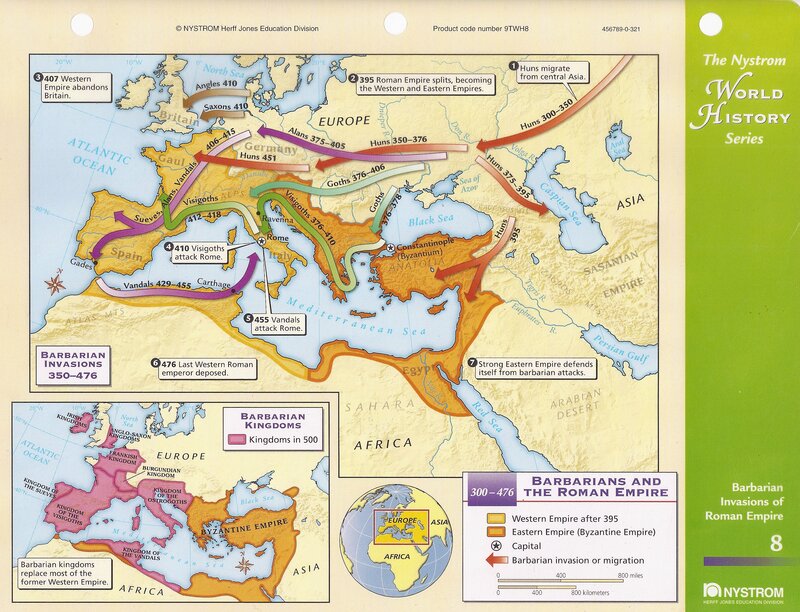 The geography of the Bay of Salamis definitely favored the Greeks. The Athenians needed a battle. The Persians did not. 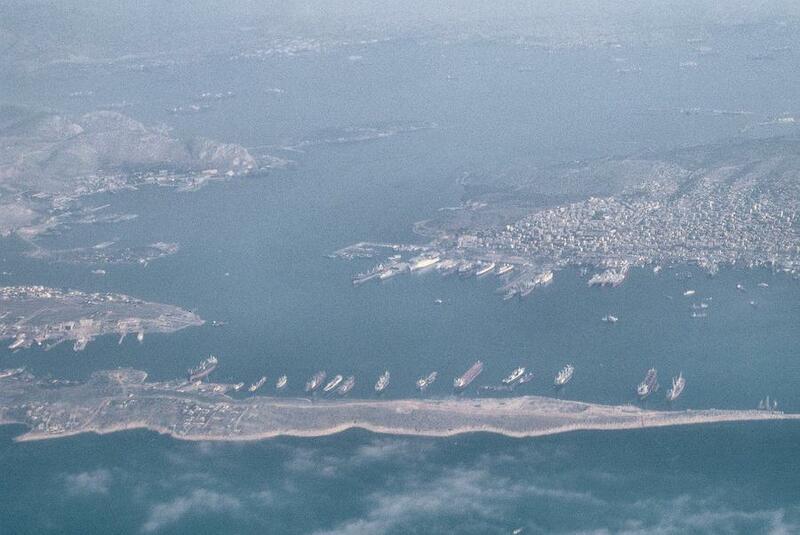 With Athens abandoned they could have simply occupied the city, and hemmed in the fleet at Salamis. If they wait eventually a tired and bedraggled fleet would have to come out of hiding and face the Persians on their terms. Fighting in the bay itself would mean narrower corridors where the Persians could not use their numbers and speed to their full effect. Think of a heavier boxer vs. a lighter, quicker opponent. The heavier one (Athens) seeks to trap or corner the other to take away his advantage. By fighting in the bay, the Persian fleet gave up much of its advantage. Again, with so many of our choices there are no guarantees. We must weigh the options and make our best guess. But it is important not to choose blindly. So why then, did the Persians attack the Greeks?Here we are back, at least possibly, to the personality of Xerxes. We saw that both Herodotus and the Book of Esther show us a king who was not wicked, but perhaps indolent, and someone who tended to flit from one thing to another. Note that Esther 1 begins by describing lavish parties amidst opulent splendor. Herodotus mentions that Xerxes wanted the invasion over as soon as possible. Ideally, of course, the Persians should have bottled up the fleet, entrenched themselves in the city, and watch Athens suffocate to death. When Themistocles sent a messenger to lie to the Persians about the disorder in the Greek ranks, the Persians jumped at the chance and moved into the bay to attack. Xerxes seems a suggestible, impatient type. “Let’s get this over with. . .” The result was a complete victory for the Greeks. It turned the tide of the whole Persian invasion. Having been smacked on the nose, Xerxes decided enough was enough. He withdrew most of his navy from the region. His infantry at current levels could not live off the land in Greece, and besides, winter approached. Without the navy to supply them, Xerxes withdrew a good portion of his troops back to Persia. 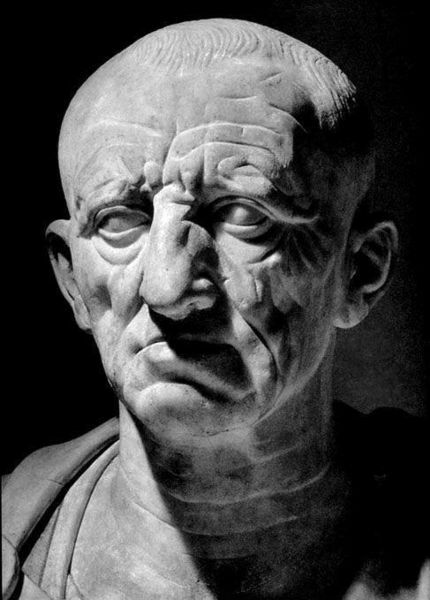 The Battle of Platea in 479 BC would, for all intents and purposes, finish them off. Clausewitz used the term “center of gravity” to describe what one colonel described as a “factor of balance” in a campaign. This does not have to be something purely physical, but in this case, the “factor of balance” in the Persian Wars would surely include control of the sea. In invading Greece en masse as they did, Persia made naval superiority a key to the campaign. But for about 75 years prior to this they concentrated their strength on their infantry. They did not play to their strength. But we might also conclude that the whims of Xerxes would constitute part of the “center of gravity.” The Book of Esther gives us clues. Note how casually he decides on the Jews destruction, and how quickly he reverses course. Of course, it’s good that he changed his mind! My point, however, is that Xerxes never seemed fitted for the role of a noble kingly persona. He would much rather not be bothered. In every conflict, the hidden factor can often be each combatant’s internal political system. 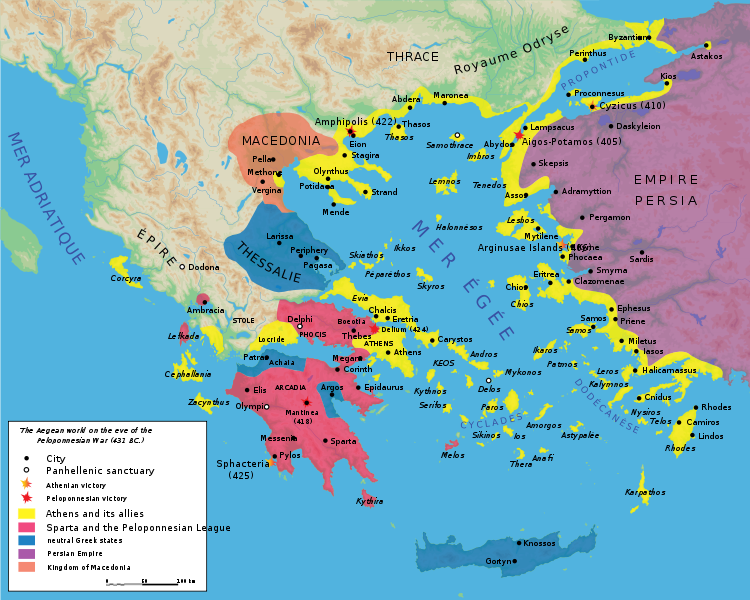 In this case, the nascent democracy of Athens had an advantage over the indolent monarchy of Persia.